RDG has the experience and the expertise to handle your project needs in the areas of: Environmental Investigation and Remediation, Environmental Engineering, Computer Modeling, Water Resources, Civil Engineering. Descriptions of some of our representative projects are described below. The projects listed are not intended to be all inclusive, but rather to provide an overview of the services we can provide. McCook, NE Fueling Facility Diesel Fuel Remediation. RDG has installed and is monitoring, operating, and maintaining a sixty-two well diesel fuel recovery and ground-water remediation system at a rail yard in McCook, NE. A detailed, three-dimensional computer model was developed for the site to assist with design and projection of system performance. As of April 2010, over 154,000 gallons of diesel fuel have been recovered by this system while it has been effective at reducing the size control of off-site hydrocarbon plume migration . Cubby's Remediation Project, Greenwood, NE. RDG installed and operated a six-well dual phase extraction remediation system to clean up a 12000 gallon gasoline spill at a gas station and convenient store site in Greenwood, Nebraska. 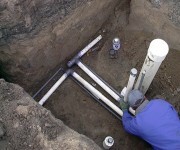 The installed remediation system was effective at removal of free product and achieving site closure within 18 months. Shopping Mall Chlorinated Solvent Investigation. Newton, IA. RDG was responsible for an investigation and characterization of a site with levels of chlorinated solvents in soil and ground-water. Activities that were done included monitoring well installation, fate and transport analysis, sewer gas and basement vapor sampling, and surface water sampling. Pesticide Warehouse Fire Emergency Response and Investigation. RDG provided technical guidance for an emergency response at a pesticide warehouse fire site in Dodge County, Nebraska. 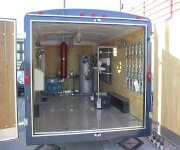 RDG coordinated air, soil and ground water sampling and RCRA disposal permitting for the project. A detailed subsurface investigation and risk assessment was also done for the project. Brownfields Manufacturing Facility Phase 1 and Phase 2 Environmental Site Assessment, Omaha, NE. RDG performed Phase 1 and Phase 2 environmental site assessments for a metal can manufacturing facility in Omaha. Specific activities for the project included a Phase 1 ESA in accordance with ASTM 1527-05, an asbestos survey, and ground water sampling. The site was subject to the requirements of a RCRA consent order and involved extensive review and analysis of historic environmental data. Ash Disposal Pond Permitting, Grand Island, NE. RDG performed site hydrogeologic characterization for permitting of an ash disposal facility for a utility located in Grand Island, Nebraska. Activities included a subsurface investigation program, ground-water sampling, development of a monitoring program, surveying, and lifetime calculations for ash disposal. Daffer Feedyard Runoff Waste Impoundment Design and Permitting, Danbury, NE. RDG was responsible for design and permitting of a livestock runoff containment facility for a 4000 head cattle facility. Aspects of this project included obtaining a zoning variance for diversion of clean runoff water and design the detainment structure so that the facility can be expanded to up to 6000 head of cattle. The project was done under the guidelines of the National Resource Conservation Service (NRCS) and NDEQ. City of Papillion Wellfield Analysis and Computer Modeling. RDG was responsible for analysis and computer modeling in support of a 20 well municipal water supply wellfield in Sarpy County, Nebraska. The three-dimensional computer model that was developed for the site considered the potential impacted to surface water flows in the nearby Platte River. Onawa Power Plant Tier 3 Ground Water Fate and Transport Modeling. RDG was responsible for the development of a three-dimensional ground water flow and transport model for a multi-layered aquifer system at a Power Plant facility in Onawa, Iowa. The model was used to evaluate potential risks to a nearby municipal water supply wells from a former release from an underground storage tank. The developed model was the first application of 'Tier 3' level screening of it's kind for a leaking underground storage tank site in the State of Iowa. Koch Water Impoundment Analysis and Litigation Support. RDG was responsible for providing technical analysis and expert witness services for a project that involved the potential construction of a surface water impoundment upstream from an existing water impoundment. The project involved a detailed survey of the construction area and an analysis of the impacted of runoff to the existing structure due to the proposed structure. West Shores Lake Drainage Assessment and Design, Douglas County, NE. 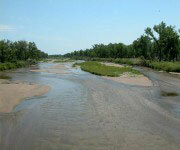 RDG was responsible for the evaluation of a high water level drainage system for a lake in Douglas County, NE. The existing system was being evaluated due to the occurrence of high levels in the lake that were resulting in beach erosion. The project culminated with the design of an additional drainage system for the lake that would double lake drainage rates in response to high precipitation events. Glass Lake Hydrologic Evaluation, Douglas County, NE. RDG was responsible for evaluating hydrologic and hydrogeologic conditions at a proposed ground water fed lake for a new development in Douglas County, NE. The objective of the evaluation was to determine potential high and low levels that would be expected for the lake based on extreme wet and dry conditions. The project was completed for a local engineering firm responsible for civil engineering design for the development. Municipal Ground Water Supply vs. Irrigation Use Conflict, Central Nebraska. RDG provided expert testimony and computer modeling for a group of irrigation landowners near a proposed well field development in South Central Nebraska. 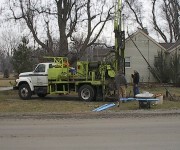 The computer model was used to project the impacts of two new municipal wells on ground water levels in existing irrigation wells. Storm Water Retention Cell Design and Construction, Lincoln, NE. RDG was responsible for design and construction oversight for a 12,000 square foot reinforced concrete stormwater holding and sediment detention facility at a scrap iron facility. The 3-celled structure was used to prevent sediments containing high levels of poly nuclear aromatic hydrocarbons and lead from entering the local storm sewer system. Neiden Iron and Metal Shear Foundation Design Project, Lincoln, NE. RDG was responsible for engineering design and overseeing construction of a 5 pier deep shaft foundation system for 600 ton metal shear. The deep foundation system was used due to the presence of compressible organic soils in the site area. McCook Public Schools Tennis Court Design. 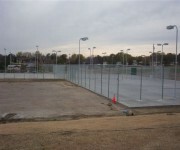 RDG assisted with the design of a six-court tennis facility for the McCook public school district. RDG's responsibilities included development of site layout and grading plans and elevation surveying of the construction area.